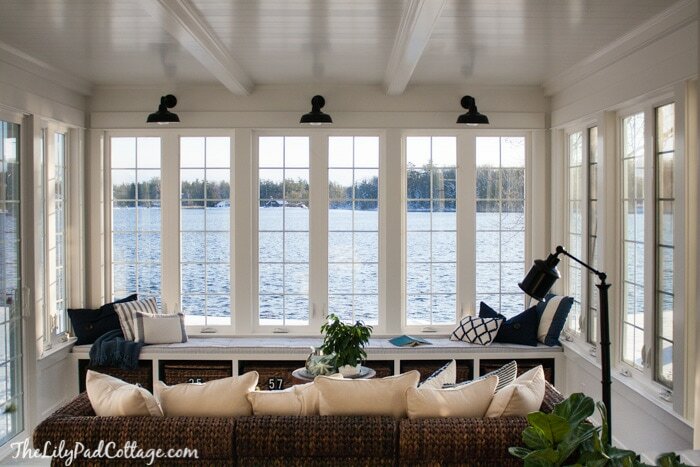 Lake House Sunroom – it’s done! I carefully set up my tripod and shot all these photos with the snow storm raging in the background, put all my stuff away, put the Christmas decorations back up and the sun promptly came out. Gah! I raced around pulling everything down again and managed to snap a few blurry shots with the sun shining, after all it’s a sunroom! So, welcome to the semi-blizzard, semi-sunny blurry photo, Christmas decor avoiding, cabin fever, TADA the sunroom is done post! The poor man, he finally gave in just so he could have a moments peace! Don’t feel too bad for him though, he readily admits building this was one of the best decisions ever (2nd to marrying me of course!). It feels like our house is complete now, just imagine our house saying “you complete me!’ in a Dr. Evil voice and you get the picture. Speaking of complete – our Pottery Barn couch that had been backordered since June finally came! It was worth the wait I love the texture it brings to the room. If you follow me on Instagram you may remember this little $15 flea market find from this summer, I took all your suggestions on colors to paint it, but in the end I went with white. I decided this room was going to be all blues and white, I love the light and crisp feeling it has. Several of you have asked me if there is any significance to the numbers on the baskets. I wish I could tell you they are all numbers with some cool sentimental value to them, but honestly they were the only numbers the hardware store had left. I sanded them to give them a vintage look and hot glued them to the baskets. Oh and my lights! Aren’t they cool? They are from Barn Light Electric and I LOVE them! I’m planning on switching out a few more lights with some of their other fixtures down the road, they just add such a fun old cottage vibe. I would show you photos of the outside too, except you know that whole -1 windchill, 2 feet of snow, polar vortex thing happening. So that will have to wait til May, I mean it has to stop snowing by then right? RIGHT? You can see more photos of the outside in progress here, and some fun along the way posts here and here. kelly, your room is absolutely perfect. it will make those 2 feet of snow, -1 wind chill days seem that much sweeter! Congrats on a beautiful job. It looks beautiful!! Well worth the wait — I’m surprised The Mr isn’t saying: I’m so glad I finally talked her into it :-) I did start to shiver when I saw the snow in the background!! I am definitely not a snow person, although I do like pictures of it — just as long as I’m not in it. I’m not a snow person either, I definitely live in the wrong state! As I look at your gorgeous room, I can almost pretend all the snow is water…..it does have a blue tint to it, don’t ya think? I think you’d find me in this room everyday, some lovely classical music playing, and enjoying a cup of tea and a good book, or working on hand stitching my latest quilt project……..sigh. Beautiful space. I can see how great this will be for your family and also for entertaining friends and family during those summer months. I really think this should be a requirement for all lake houses! Beautiful view and I love those barn lights. They kind of have a boathouse feel for me. Enjoy! Also, there is snow where I am this week too. This morning the temperature was 9 degrees, the warmest it’s been all week. yes! Boathouse is exactly the feel of the lights, stay warm!! Love it! And I can totally relate to the whole photography thing! 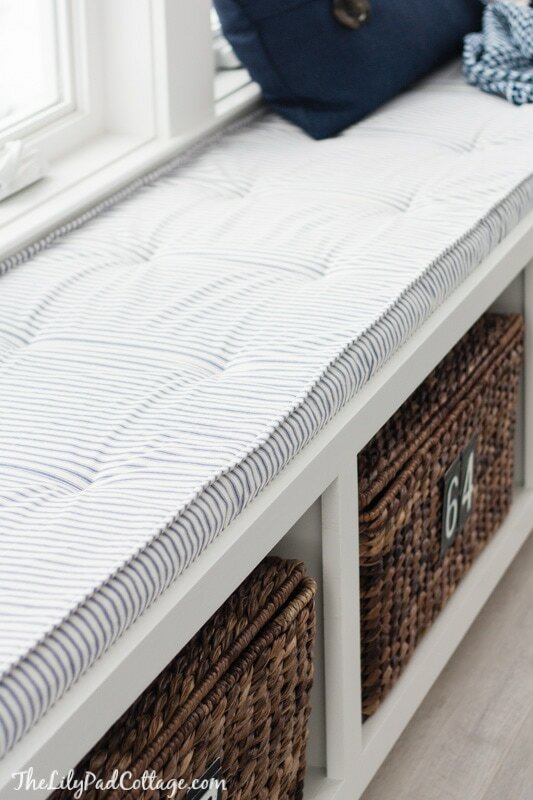 Your room is lovely – enjoy it! It’s perfect for a home on the water! 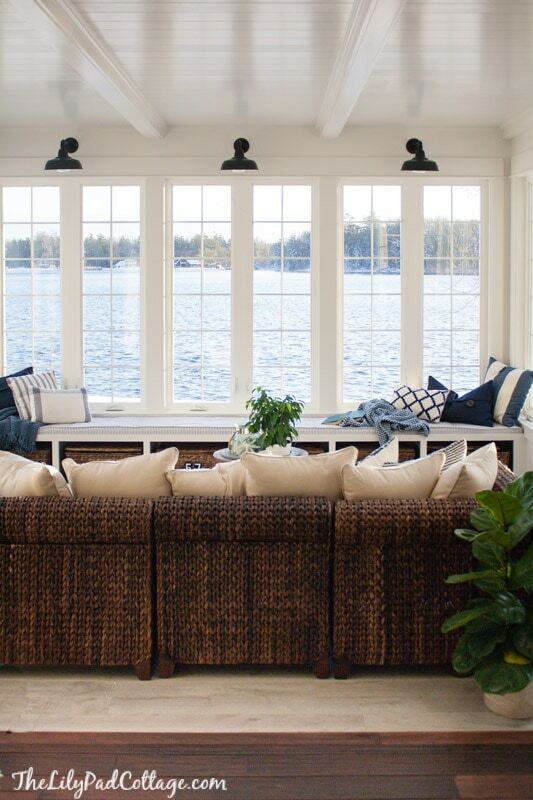 What a gorgeous sunroom!! I love everything about it and the colors are perfect! I would be content living in just that one room with that kind of view! :) I’m sure you all will enjoy it – either winter or summer! Awesome room! And a very good reminder of why I LOVE living in the South–no snow! ha, enjoy the sunshine down there! It looks amazing! 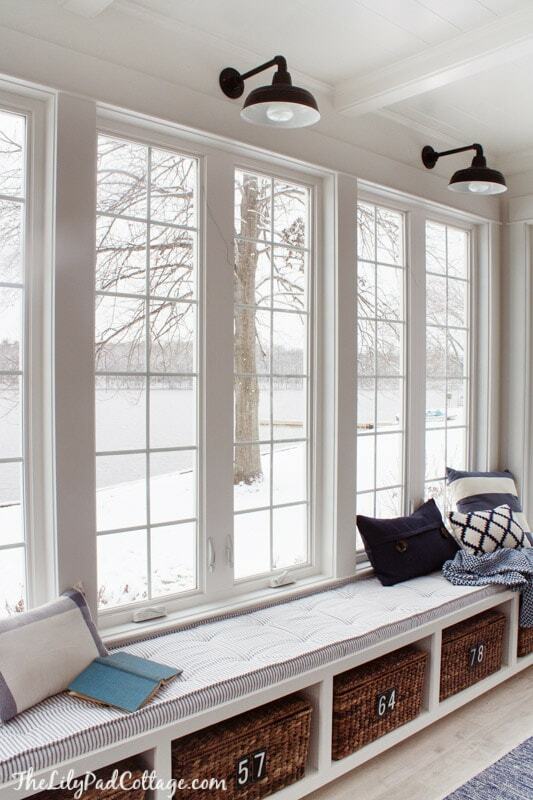 I could totally envision myself with a cup of hot chocolate and a book curled up in the window seat watching the snow blow across the lake! Congrats on an amazing project! Thank you Stephanie, sipping hot chocolate as we speak! Oh my!!! It is fabulous! I love it! everything from the lights to the tufted seat cushion is just spot on amazing! Gorgeous Kelly!!! Worth the wait. You gave me inspiration to complete my built in bench by my back door that has been patiently waiting for me. 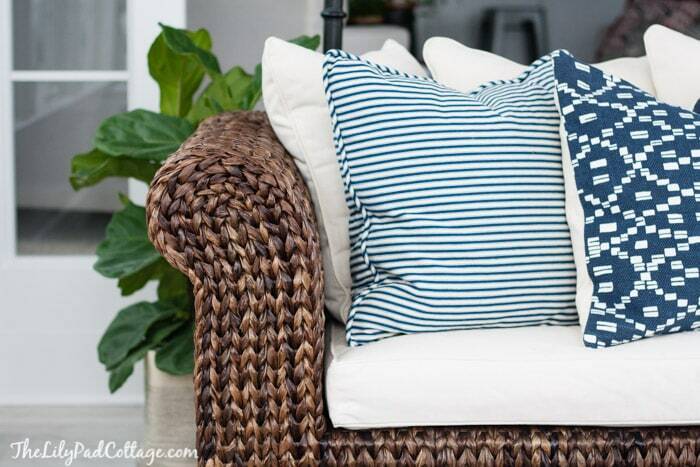 I LOVE the cushion your mother in law made….great job!! ENJOY the room! Thanks Gloria, good luck with your bench! Oh my word, this is totally stunning. I love everything. Even with the snow this is a dream. I’ve been following this process since the beginning, and I must say it is ah-mazing! You did such a great job!! I love absolutely everything about it!! Your mother in law is a total rockstar, that cushion is fabulous. Enjoy, enjoy, enjoy!!!! She is a rockstar, it turned out just how I wanted! Thanks! Love your sunroom – must be happy to have it finished at last! 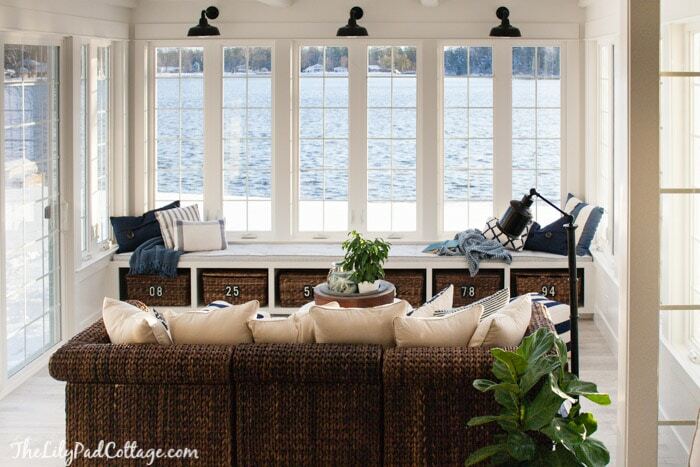 I especially like the window seat with baskets for storage underneath – I think I will do this to our lake house sunroom and I’ll think of you every time I am out there. Yes, you will love it Janet! It is a lovely room whether sun or snow i could set out there and veg.Have a great day. That sounds perfect about now! The room looks amazing!!! Love those lights and that window seat! 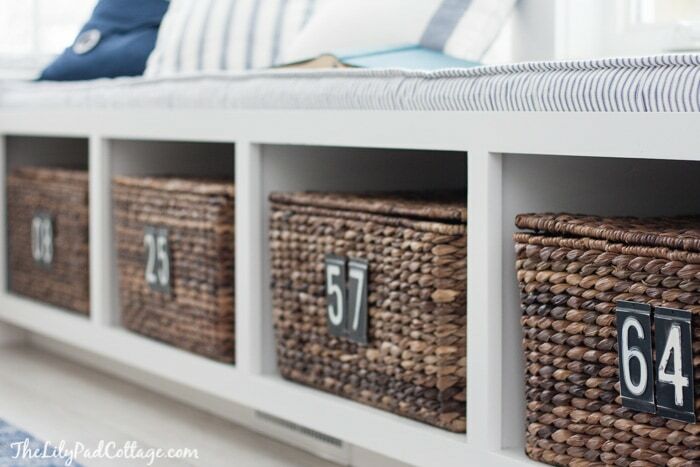 The seagrass sofa adds the perfect amount of texture mixed with the baskets. I have the PB Seagrass chairs and we love them. Enjoy – and stay safe! Awesome job. It looks like a happy, cheery place to be no matter what the weather is. Thanks Sherry, it is very cheery! So beautiful and fun. 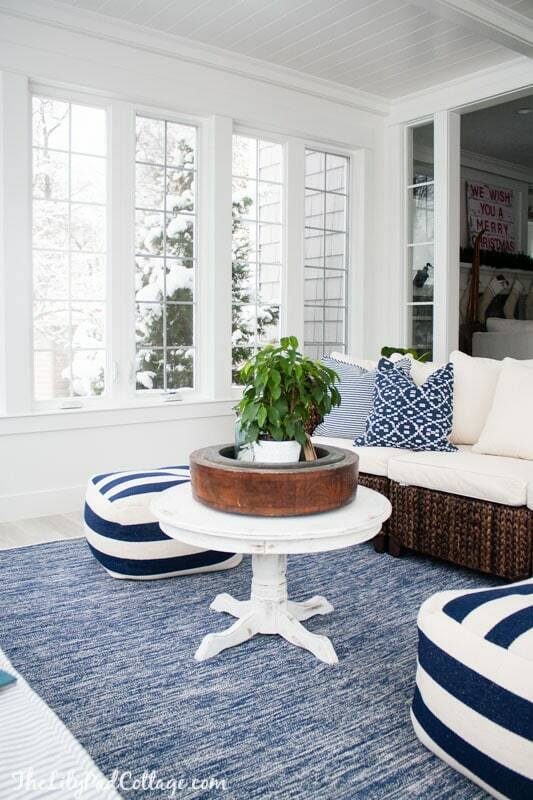 I also have a sunroom done in blue and white but it is not heated, so after Oct we close the doors until warm weather. 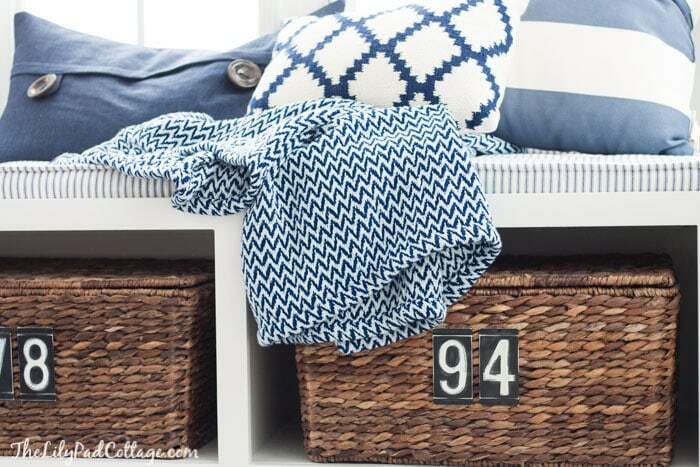 I know I am missing something as I don’t understand the numbers on the baskets? Wow Kelly.. its stunning!!! I love it.. What a view!! 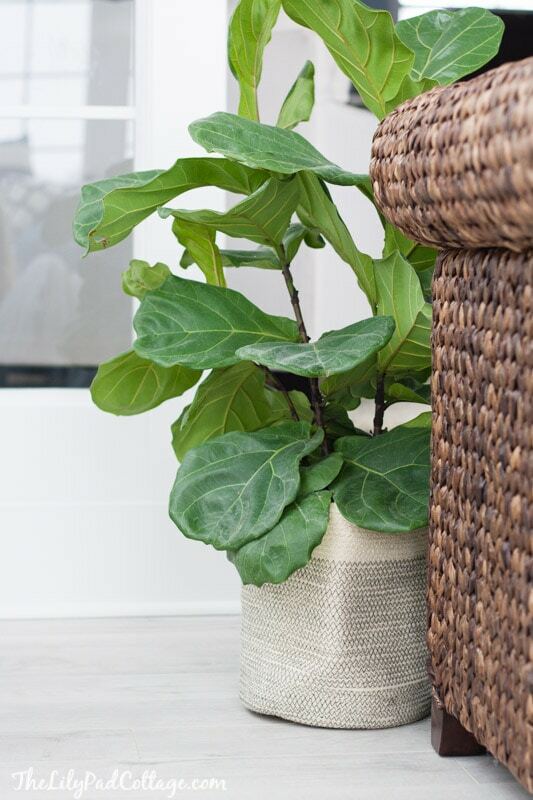 You have such a beautiful home..what a great addition your sunroom will make. Thanks Lisa, it feels like our house is finally complete! Can I ask what color white do you use on walls? Silent White by Clark+Kensington thanks! 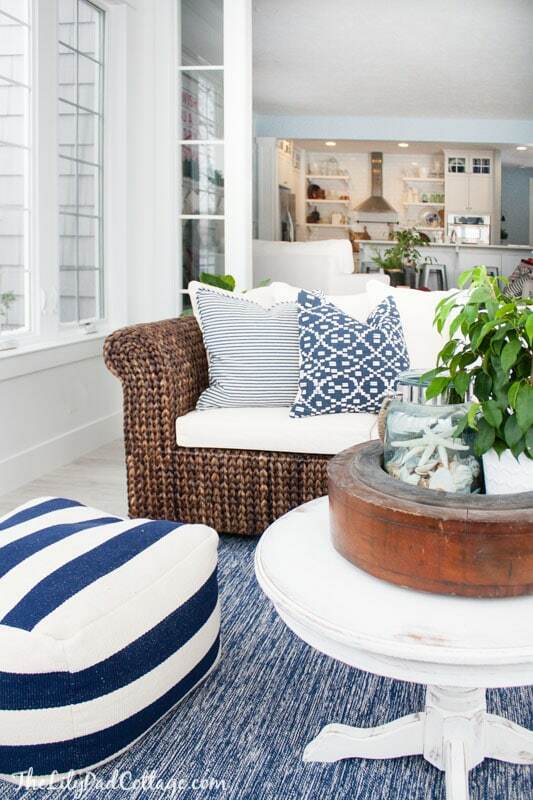 Kelly, I have long awaited your reveal of the sunroom and I was not disappointed! I am so excited for you guys. I see you making use of that all winter with long cold nights snuggled up on a bench with a book. Or wait, is that what I want to do be doing? Sorry I temporarily just invaded your sunroom. Okay, it is yours again. Enjoy! haha, glad I got it back :) but happy to share! Such a gorgeous space Kelly! Everything is perfection! Thanks Sarah! So happy we can finally enjoy it! I’m in LOVE with this space! And that sofa….TO DIE FOR! Fantastic job! Thanks Carla, so glad we finally have it done! Hi! I am just in love with your house. 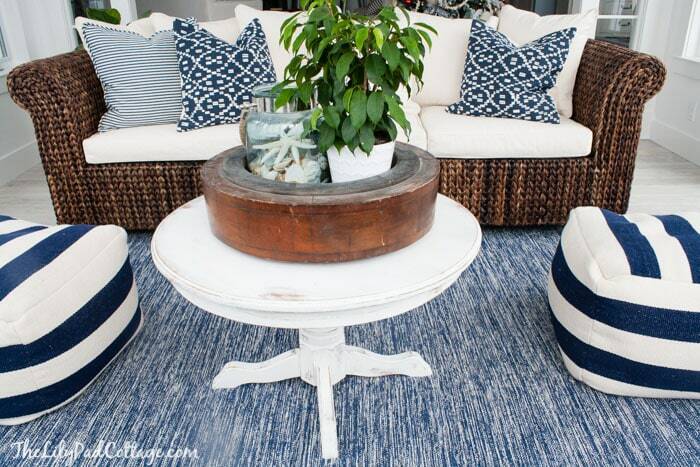 Do you remember which rug and color you have in the sunroom? I have found a few on the West Elm website that look like it, but I am not sure. can you tell me where you bought the baskets? Pottery Barn and then I added the numbers myself. 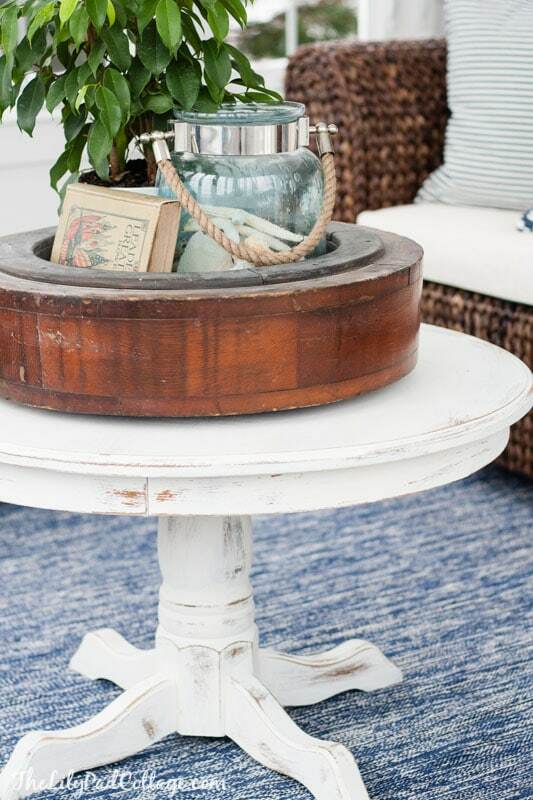 What is the round object on the coffee table? The entire room is pretty and restful, but that is a conversation starter! Hi Jennie! I picked it up from a flea market, the guy there told me it was some sort of vintage factory mold. I had no idea what I was going to use it for but I had to have it! I am re-doing a sun room as well that is part of a house we just purchased. It has a very long window seat under a wall of windows similar to yours. There is no cushion for it. I am looking into having someone make one for me. Could you or your mom share with me what materials were used and a ballpark figure of what this might cost me? I haven’t measured the exact size but I am sure it’s at least as long as yours? Maybe instead of one long one I should use two shorter ones? Any thought or help is appreciated! Hi Amy, I’m not sure how much it would cost someone to make you since my mother in law did it for free :) If you know someone who sews or sew yourself it wouldn’t cost that much. I think I used about $30 (with a coupon) of 2 inch thick foam. Then we wrapped batting around the whole thing and sewed that tight. Then we put a cheap cotton cover that we sewed over the whole thing to keep it together before we put the actual cover on. My bench is 14 feet long, 2 7 foot long cushions may be easier but I didn’t want to break it up. I’m guessing the whole thing cost me under $100? Maybe $75? Good luck! You are sooo talented! Love, love, love it! Could you please share the name/brand of the paint colour you used on the walls & trim? Is it all the same? What sheen did you use? Thank you so much! My apologies! Just saw your answer to same question above. Was looking at the same barn light electric lights for my sunroom and am confounded by the choice of shade width. They come in 11,13, 15 and 17. Can you tell me which width you used? Our sunrooms are very similar and it would help give me some perspective! Oh man I think they are the 13? I love all your colors throughout your entire house! I have a question about the Pottery Barn Seagrass couch, how is it holding up? I’ve been hitting my Hubby up for years to purchase one at some point and he thinks they won’t weather well, and he thinks they won’t be very comfortable. I sure hope he’s wrong because I love them! I love the blue rug but I’m not seeing it on the west elm website. Is it older? The room is fantastic!!! HI Evelina, they don’t carry it anymore, they have a few similar styles though! Just beautiful! I have a sun room that has been in the making for a few yrs as we have paid cash for all of the reno and my Husband worked on it when he had time. It started out as a horribly bad coverd porch addition thingy that the previous owner did. It now has a beautiful rock floor ,frenchdoors (75.00 craigslist ) 2 of the huge windows ( 150.00 craigslist ) We are on schedule to sheetrock in now. I cant wait ! Love,love yours you are a lucky girl! Hello! I am absolutely in love with this room! Can you tell me what the dimensions are of the actual room? We will have a sunroom in our new home that is approximately 13′ x 9′! 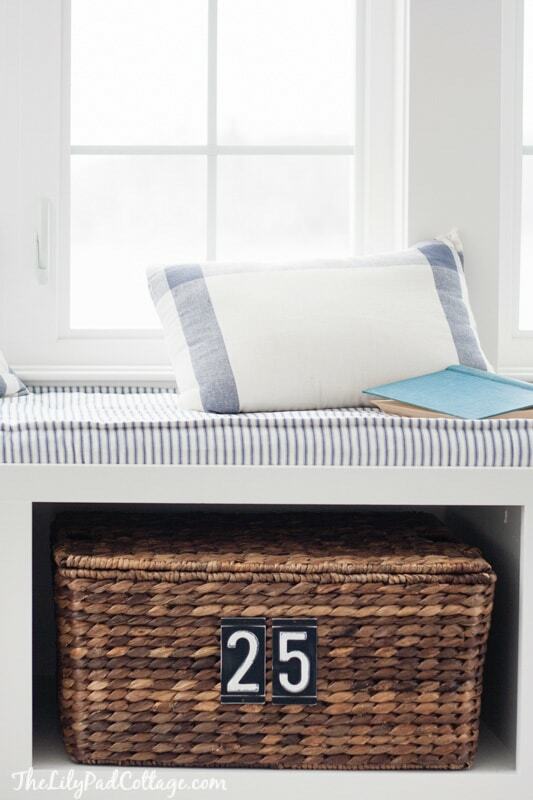 Am looking to replicate a low profile under window storage area under a huge waterview window. Curious what the height of the built in is from the floor , not including the cushion. Thanks ! This is a beautiful sunroom!!! Will you please share the brand of windows that you used? They are so beautiful. We are turning a screened porch into a sunroom and would love to use these windows. Thank you so very much. Hi Louise, we don’t live here anymore but I think they were maybe Jeldwin? Thanks!